Covers the testing framework for Java that automatoes unit tests using Test-Driven Deployment or Behavior-Driven Deployment. A unit test is a test related to a single responsibility of a single class, often referred to as the System Under Test (SUT). The purpose of unit tests is to verify that the code in an SUT works. A tested object usually talks to other objects known as collaborators. These collaborators need to be created so the tested object can be assigned to them in the test. To make unit testing simpler and allow control of all aspects of the execution context, it is useful to replace the real cooperating objects with their fake replacements called test doubles. They look like the originals, but do not have any dependencies to other objects. Test doubles can also be easily programmed with specific expectations, such as recording any interactions they've had. To make it clearer, try to imagine code for a typical en- terprise system. Now here's a service with some logic that needs two classes to fulfill its responsibility. Both classes then require a few other classes. One of these other classes could be a DAO, which needs access to a database, while yet another requires a message queue. It would be quite an effort to create that hierarchy and provide required resources. There could also be problems while running that kind of test, e.g., long startup times or the inability to test multiple developer stations simultaneously. Using Mocks, though, the same test could be much cleaner and faster. Mockito is a mocking framework helpful in creating mocks and spies in a simple and intuitive way, while at the same time providing great control of the whole process. It will add JAR with Mockito classes as well as all re- quired dependencies. Change 1.9.0 with the latest released version of Mockito. This Refcard is based on the latest stable version 1.9.0. Some things are about to change in the further Mockito versions. Warning: If you want to use @Mock or any other Mockito annotations, it is required to call MockitoAnnotations.initMocks( testClass ) or use MockitoJUnit4Runner as a JUnit runner (see the annotation section below for more information). One of the basic functions of mocking frameworks is an ability to return a given value when a specific method is called. It can be done using Mockito.when() in conjunction with thenReturn () . This process of defining how a given mock method should behave is called stubbing. 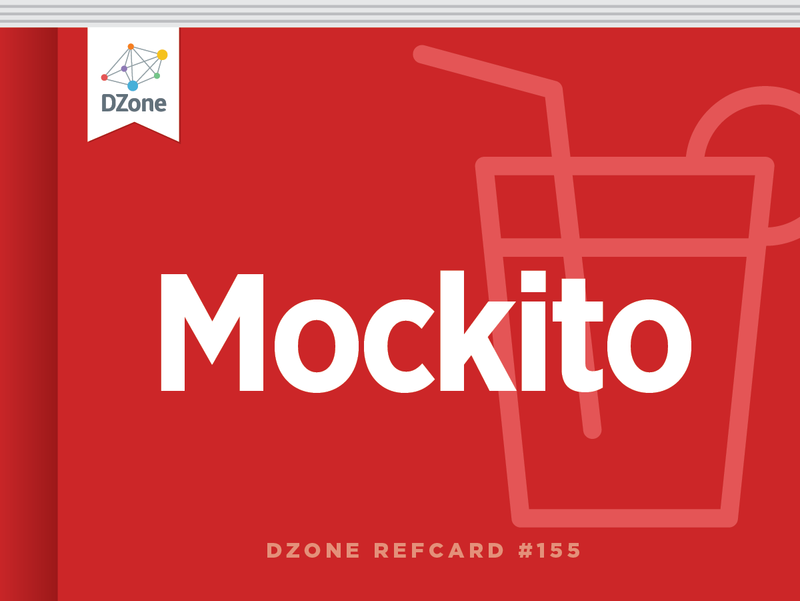 Warning: Note that the examples in this Refcardwere created to demonstrate behaviors of Mockito in a specific context. Of course, when writing the test for your codebase, there is no need to ensure that mocks are stubbed correctly. Mockito makes heavy use of static methods. It is good to use static imports to make code shorter and more readable. IDE can be used to automatize adding static imports. Mockito provides a family of functions for requesting specific behaviors ring. Non-void methods return by default an "empty" value appropriate for its type (e.g., null, 0, false, empty collection). Following an arrange-act-assert pattern (similar to given- when-then, from Behavior Driven Development) a test should be split into three parts (blocks), each with a specified responsibility. given-when-then comments make intentions of tests clearer. Mockito, by default, compares arguments using equals () methods. Sometimes it's convenient to know exactly what parameter the method will be called with. Very often we needed to define a wider matching range. Mockito provides a set of build-in matchers defined in Matchers and AdditionalMatchers classes (see corresponding table). If an argument matcher is used for at least one argument, all arguments must be provided by matchers. 3 matchers expected, 2 recorded. The methods from the any() family don't do any type checks. Various variants were created to avoid casting. To perform type checks, method isA(Class) should be used. Sometimes you want to return different values for subsequent calls of the same method. Returned values can be mixed with exceptions. The last value/behavior is used for all following calls. will/doXXX methods are also handy when working with spy objects, as will be seen in the following section. A given / when construct allows Mockito to internally use the type returned by a stubbed method to provide a typed argument in the will/ thenReturn methods. Void is not a valid type of it causes a compilation error. Will/doReturn does not use that trick. Will/doReturn can be also used for stubbing non-void methods, though it is not recommended because it cannot detect wrong return method types at a compilation time (only an exception at runtime will be thrown). It is not recommended to use do/ willReturn for stubbing non-void methods. In some rare cases it can be useful to implement a custom logic, later used on a stubbed method invocation. Mockito contains a generic Answer interface allowing the implementation of a callback method and providing access to invocation parameters (used arguments, a called method, and a mock instance). Warning: The need to use a custom answer may indicate that tested code is too complicated and should be re-factored. Once created, a mock remembers all operations performed on it. Important from the SUT perspective, these operations can easily be verified. In the basic form, use Mockito. verify (T mock) on the mocked method. By default, Mockito checks if a given method (with given arguments) was called once and only once. This can be modified using a VerificationMode. Mockito provides the number of very meaningful verification modes. It is also possible to create a custom verification mode. As an alternative to never (), which works only for the specified call, verifyZeroInteractions ( Object ... mocks) method can be used to verify no interaction with any method of the given mock(s). Additionally, there is one more method available, called verifyNoMoreInteractions ( Object ... mocks), which allows to ensure that no more interaction (except the already verified ones) was performed with the mock(s).verifyNoMoreInteractions can be useful in some cases, but shouldn't be overused by using on all mocks in every test. Unlike other mocking frameworks, Mockito does not automatically verify all stubbed calls. It is possible to do it manually, but usually it is just redundant. The tested code should mainly care about values returned by stubbed methods. If a stubbed method was not called, while being important from the test perspective, something else should break in a test. Mockito's philosophy allows the test writer to focus on interesting behaviors in the test for the SUT and his collaborators. Mockito does not automatically verify calls. Mockito enables you to verify if interactions with a mock were performed in a given order using the InOrder API. It is possible to create a group of mocks and verify the call order of all calls within that group. During a verification of an interaction, Mockito uses equals () methods on the passed arguments. This is usually enough. It is a l s o possible to use the standard matchers, described earlier about stubbing, as well as custom matchers. However, in some situations it may be helpful to keep the actual argument value to make custom assertions on it. Mockito offers an ArgumentCaptor class, enabling us to retrieve the argument passed to a mock. ArgumentCaptor can be also created using @Captor annotation (see appropriate section with annotations). Warning: It is recommended to use ArgumentCaptor with verification, but not with stubbing. Creating and using a captor in two different test blocks can decrease test readability. In addition to a situation when a stubbed method is not called, no argument is captured, which can be confusing. It is possible to retrieve arguments of all calls of a given method using captor . getAllValues (). Warning: When an SUT internally uses the same object reference for multiple calls on a mock, every time changing its internal state (e.g., adding elements to the same list) captor . getAllValues () will return the same object in a state for the last call. Mockito lets you verify interactions within a specified time frame. It causes a verify() method to wait for a specified period of time for a requested interaction rather than fail immediately if that had not already happened. It can be useful while testing multi-threaded systems. Warning: Currently, verifying with timeout doesn't work with inOrder verification. Warning: All the multi-thread tests can become non-deterministic (e.g., under heavy load). With Mockito, you can use real objects instead of mocks by replacing only some of their methods with the stubbed ones. Usually there is no reason to spy on real objects, and it can be a sign of a code smell, but in some situations (like working with legacy code and IoC containers) it allows us to test things impossible to test with pure mocks. When working with spies it is required to use the willXXX..given/ doXXX..when methods family instead of given .. willXXX/when.. thenXXX. This prevents unnecessary calls to a real method during stubbing. Warning: While spying, Mockito creates a copy of a real object, and therefore all interactions should be passed using the created spy. Mockito offers three annotations–@Mock, @Spy, @Captor– to simplify the process of creating relevant objects using static methods. @InjectMocks annotation simplifies mock and spy injection. It can inject objects using constructor injection, setter injection or field injection. To get annotations to function, you need to either call MockitoAnnotations.initMocks( testClass ) (usually in a @Before method ) or use MockitoJUnit4Runner as a JUnit runner. To make a field injection with @InjectMock, Mock- ito internally uses reflection. It can be especially useful when, in the production code, dependencies are injected directly to the private fields (e.g., by an IoC framework). Warning: The last three default answers should not be needed when working with well-crafted, testable code. The behavior can be configured per mock during its creation or globally for all tests using GlobalConfiguration mechanism (it helps to use RETURNS_SMART_ NULLS by default). Check "Beyond the Mockito Refcard" (see link below) to get a complete tutorial on how to easily configure SmartNulls for the whole project. Also, other useful information is there that's not in this Refcard. In some rare cases (like using a mock as a bean in an IoC container) you may need to reset a mock using the Mockito. reset (T ... mocks) static method. This causes the mock to forget all previous behavior and interactions. Warning: In most cases, using the reset method in a test is a code smell and should be avoided. Splitting a large test into smaller ones with mocks created for each can be helpful. Nevertheless, when working with a badly written legacy code, remember that some of the mentioned limitations can be mitigated using the PowerMock or JMockit libraries. PowerMock or JMockit can be used to work with code that cannot be mocked with pure Mockito. Non-void methods return by default an \"empty\" value appropriate for its type (e.g., null, 0, false, empty collection). org.mockito.exceptions.misusing.InvalidUseOfMatchersException:\n    Invalid use of argument matchers!\n    3 matchers expected, 2 recorded.\n    This exception may occur if matchers are combined with raw values:\n    //incorrect:\n    someMethod(anyObject(), \"raw String\");\n    When using matchers, all arguments have to be provided by matchers.\n    For example:\n    //correct:\n    someMethod(anyObject(), eq(\"String by matcher\"));\n\n    For more info see javadoc for Matchers class. The methods from the any\u0003() family don't do any type checks. Various variants were created to avoid casting. To perform type checks, method isA(Class) should be used. Check \"Beyond the Mockito Refcard\" (see link below) to get a complete tutorial on how to easily configure SmartNulls for the whole project. Also, other useful information is there that's not in this Refcard.